I don’t think I’ve posted a description of my current interface for tracking, so here are a few quick screenshots. This is the main interface that I’ve bookmarked on my phone and on my computer. It’s a simple web-based interface with lots of big buttons. 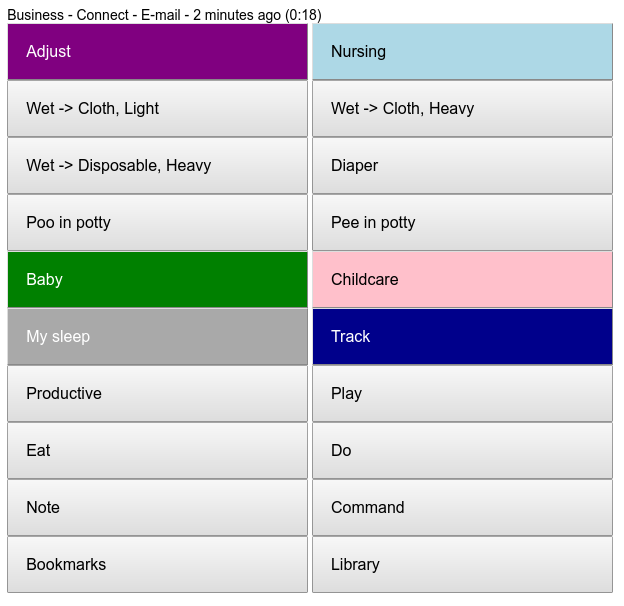 It lets me track baby-related things as well as my time with a tap or two. If I need to do something more complicated, I can use the command button to pass a text command to my tracking interface. When I have a little more time, I might tweak the interface a bit, but it will do for now. I’m glad I put this together. It makes time tracking something I can do even with a baby, yay! All the reports in my blog posts are handled by Emacs Lisp functions that talk to quantifiedawesome.com and summarize my time data. You can find the code at http://sachachua.com/dotemacs and lisp/quantified.el . I’m interested in Quantified Self as a way to make better decisions through data. When I come up with a question I want to explore, I usually start off tracking things on paper or in a spreadsheet. This means I can get started quickly, and I can check whether the question is useful enough to invest in further. I track my clothes to make it easier to simplify my wardrobe, and to guide my purchases. I started by writing down dates and clothing combinations on an index card in the morning. Since my index card was unlined and my brain is pretty fuzzy early in the day, I occasionally had problems with incorrect dates or items not matching up. Eventually, I built a small Rails application (Quantified Awesome) to keep track of the clothes for me. Adding pictures made it easier to select the right item. Over time, I added little conveniences like the ability to display or sort by the last time I wore something. I often find myself backdating entries, so maybe tracking my clothes isn’t as easy or as fun as it could be. I wonder if making it more prescriptive (“Pick one of these three outfits, or select what you’re going to wear”) would help, or maybe integrating it more into my morning routine. I track my time to guide my activity decisions and remind me of how I used the time. I used apps on my phone to track time for a few months. I started with Time Recording and a few categories, adding more as I went along. When the number of categories got to be a bit unwieldy, I moved on to Tap Log so that I could organize the buttons into a menu. Since it didn’t have the built-in time analysis I liked about Time Recording, I added time analysis tools to Quantified Awesome. After I added other features to Quantified Awesome, I shifted to using it as my time tracking and analysis tool. My next step is probably to build more time visualizations so I can see the shifts from day to day, week to week. I track groceries so that I can make better decisions at the supermarket and so that I can get a sense of the balance and patterns of our consumption. I started by typing in my receipts manually, but it was a little boring. I paid a virtual assistant to enter the data from my scanned receipts. This worked out to be better than the receipt scanning companies that were out there, since I could get line-item detail in a spreadsheet shared in Dropbox. I periodically reviewed the data, fixing errors and analyzing totals. After some time doing this and quite a few errors in the data, I decided to build my own interface for entering data more reliably. Now that I’ve built my neat interactive interface, I find it faster (and more fun!) to enter the data in myself than to scan it and send it over. I’ve been digging into visualizing the data with D3 too. My next step is probably to build a grocery list interface for it. We’re currently using OurGroceries because it syncs well between my husband’s phone and mine, but I should be able to use either straight AJAX or WebSockets to get the synchronization part working. I tend to code the next step of improvements only when something annoys me enough for me to do something about it or when a question makes me curious enough to want to investigate it. I’ve been deliberately working on my personal projects more often, though, and that might lead to more of these little improvements. We’ll see! Analyzing my grocery data is more challenging than analyzing my time data. There’s a lot more data cleanup needed. I have to figure out obscure line items on old receipts and catch typos in both names and numbers. Then there’s figuring out how much I want to combine different items and how much I want to keep them separate. Categories are handy for reporting too. Because of the ad-hoc way I created receipt item mappings and assigned them to categories, I ended up with inconsistent categorization. Some types of toilet paper were in the Supplies category, and some types were in the Other category. I manually reviewed the category assignments and I think I’ve gotten them sorted out. Anyway, analyzing my data from 2013-07-01 to 2015-07-01, I see that we spend an average of $80 per week on groceries, which sounds about right. Some of the receipts are missing and there are almost certainly other little errors in the data, but this should give me the overall picture. I’m still trying to figure out a good way to visualize the data in order to answer the questions I’m curious about, so here are my notes along the way. X axis is date, Y axis is total cost on that day, color is how it compares to the average price it is (lower price than average = blue, higher = orange). Milk consumption is pretty straightforward. Every week, we use around 0.6 bags of milk (~2.4L) – more when J- and her friends are over (teenagers!). The price of milk has stayed at $4.97 per 4L, except for the time we bought a slightly more expensive type of milk (~Oct 2013) and the time in June 2014 when a smaller size was on sale, so we picked up one of those instead. We used to buy extra-large eggs, but the supermarket close to us stopped carrying 18-packs of those, so we switched to 18-packs of large eggs instead. The price of large eggs is stable at $4.27 for 18. We use ~11 eggs a week. We stock up on canned tomatoes when they go on sale, since they’re easy to store. We probably use ~3 cans a month. The sale price has drifted up from $0.88 to $0.97, while the regular price is a little bit over $1.50. We haven’t bought butter at full-price in two years. The sale price for unsalted butter tends to be between $2.77 and $3.33, while the regular price is $6+. I like strawberries, but I stopped buying them for a long time because they seemed like such an indulgence and the sweetness tended to be hit-or-miss. This year, I gave myself permission to splurge on strawberries in season. We seem to go through banana phases. When we hit banana overload, we stop for a while. The colours here are just due to floating point imprecision. Bananas have actually stayed the same price for the past two years ($1.26/kg). We like picking up ambrosia apples during the rare occasions they’re available. Last winter was a good one for ambrosia apple availability. Lots of whole chickens lately, because of the rotisserie. Our main protein, although we also buy a fair bit of beef and pork, and chicken drumsticks/thighs when they’re on sale. Today was another good day for writing code. I finally built that quick-feedback receipt item tracker I’ve been thinking about for a while. I’d built a simpler version into Quantified Awesome (not linked from the main interface, since it was very rough), but I found the browser roundtrip too disruptive. Today’s implementation uses Angular for faster responses. For good measure, I’ve got a NodeJS server proxying the requests to either my local development copy of Quantified Awesome or to my production version. On the left side, I have a scanned receipt in Autodesk Sketchbook Pro (or a paper receipt on the side). 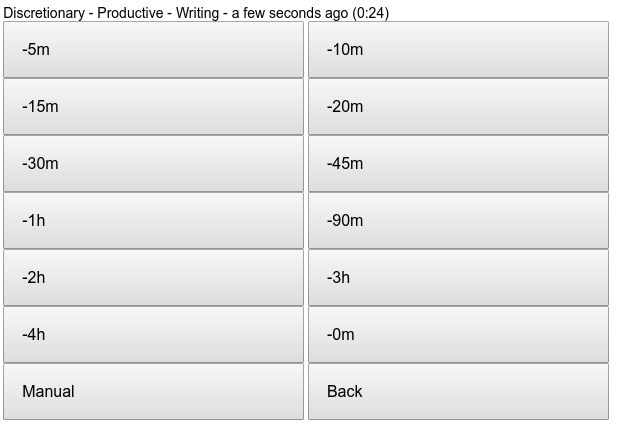 On the right, my autocompleting tracking interface. It’s not pretty, but it fits what I have in my head. I like the way that typing in the first few characters of the receipt line item is often enough to uniquely identify the receipt item type and retrieve the price history. This means that as I track, I also get a sense of the price trends and what a good sale is. Next up: fast categorization, some graphing… I’m also looking forward to making a quick price book interface. Hmm, if I dust off that grocery list tool I had started building into Quantified Aweome and I integrate the price book, that might be handy. I’ve been thinking about building more tools for myself. Some of the ideas I’ve been playing around with are around simplifying activity tracking further, possibly getting it to the point where it suggests things for me to do when my brain is fuzzy. One advantage of using something on my phone is that I don’t have to wait for the initial web page from Quantified Awesome to load. My keyboard occasionally takes a while to come up, too, so the menu-based interface gets around that as well. 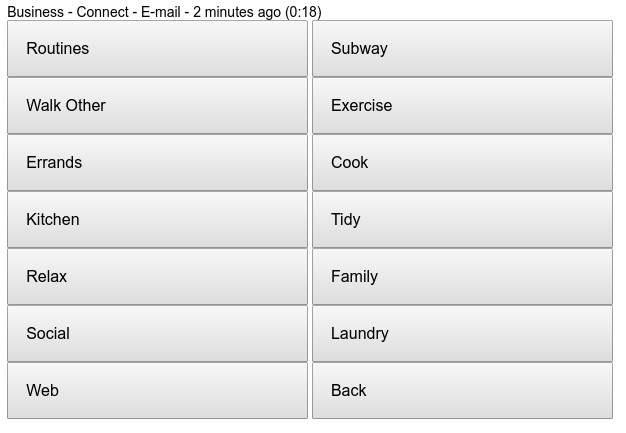 Also, as I get the hang of using Tasker, I can set up more intelligent processes. The menu has a link to open the web version, so if I want to track something less frequent, I can always use the web interface. In the web interface, I usually type a substring to identify the category I want to track. For example, “kitch” results in an activity record for “Clean the kitchen”. I use this interface if I need to backdate entries (ex: -5m), too. In addition to the two interfaces above, I’ve been thinking about taking advantage of the predictability of my schedule. Context-sensitive menu with a handful of items (3-4, with a link to more): I can probably suggest candidate activities based on the past two activity records. That might mean a little bit of latency as I check, though. It also means that the menu will keep shifting, so I’ll need to read it and find the item I want to click on. Sometimes, when I sit down to draw my five index cards of the day, I have a hard time delineating five interesting thoughts – things I want to remember or share. They often seem so inward-turned. I was thinking about the shape of my blog, too. I feel like I’ve shifted from a lot of technical posts to a lot of reflective posts. Possibly less interesting for other people, but useful to me. It’s hard to tell. These are the kinds of posts I’ve been starting to find useful in other people’s blogs, anyway, so who knows? Maybe these things are interesting for other people too. While writing a recent post, I searched my archives to trace the evolution of my understanding of uncertainty over several years. I can remember not having these snapshots of my inner world. When I reviewed ten years of blog posts in preparation for compiling Stories from My Twenties in 2013, I was surprised by how many technical and tip-related blog posts I skipped in favour of keeping the memories and the questions, and the sense of things missing from my memories. Maybe that’s why I wrote almost three times the number of reflective posts in 2014 as I did in the previous year. 2014 was also the year I switched the focus of my experiment from other-work to self-work, and that might have something to do with it too. I’m glad I have those thinking-out-loud, figuring-things-out posts now. The end of April was around 33% of the way through the year, so I’m slightly ahead of last year’s reflective-post-density (expected: 20 posts, actual: 25). Comments are rare, but I’ve learned a lot from them. 2014: Visual book notes: Mastery: I was drawing a lot of book notes in addition to writing about Emacs. Around this time, I was worried about whether I was slacking off, but actually, things were pretty good. 2013: Learning update May 2013: Hmm, this is still a pretty good list. 2012: Sketchnotes: Jeremiah Owyang @ Third Tuesday Toronto (#3TYYZ) on the Social Business Hierarchy of Needs: I used to go to more events. Now I tend to prefer to learn from books or the Internet. 2011: Cattus Petasatus: Latin learning is on hold at the moment. 2010: Even more awesome LotusScript mail merge for Lotus Notes + Microsoft Excel: I still get comments about this, even though it’s been years since I last used Lotus Notes. 2007: Didn’t write anything on that day, but the next post was about a hastily-organized trip home. 2006: Didn’t write anything on that day, but the next post was about the Mesh conference. Hey, Jen Nolan’s name turned up! Neato. 2005: People with a passion…: Emacs development and community stuff. =) Still at it! 2004: A couple of snippets of flash fiction. 2003: Didn’t write anything on that day, but the next post was about being late for school.